Didn't go a long way today, but I saw a heck of a lot. That includes the alligator at the end of the log in the photo. I know, it's too small to see here so you'll have to trust me on this. 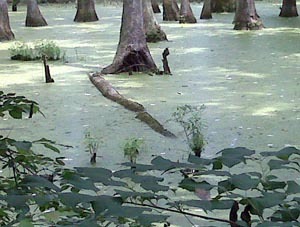 Besides the wildlife in Cedar Swamp, I found dozens of interesting sites along the "Trace" between Natchez and Tupelo. In that nearly 300 mile stretch l learned about the Indian trails that tied together to create the route, about "stands" that were inns, and "post" (mail) roads. There were several Indian mounds, antebellum plantation houses and tales of individuals, groups and armies who traversed the Trace for their own reasons from as early as the 1300s to the late 1800s. I walked parts of a couple segments of the old trail and tried to imagine myself in the prime of the route. There was something to see almost every mile. This was maybe the most interesting ride I've ever done!